Steve Morlidge presents results from two test datasets (the first with high levels of manual intervention, the second with intermittent demand patterns), intended to challenge the robustness of the avoidability principle. Results from the second dataset (880 SKUs across 28 months, with intermittent and lumpy demand) were similar. The first observation is that relatively few items have the MAE ratio below 0.7 (and almost none below 0.5). 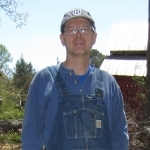 Steve suggests that a ratio around 0.5 for MAE (less for MSE) may represent a useful lower bound benchmark for how good you can reasonably expect to be at forecasting. The second observation is the large number of SKUs with a ratio above 1.0 -- meaning that the naive forecast was better! (In both datasets, over 25% of SKUs suffered this indignity!) These are examples of negative Forecast Value Added. To further assess the usefulness of the avoidability concept, Steve welcomes participation from companies willing to further test and refine the approach. If you have data (suitably anonymized) you are willing to share, or have other questions or comments, you can reach him at steve.morlidge@satoripartners.co.uk. 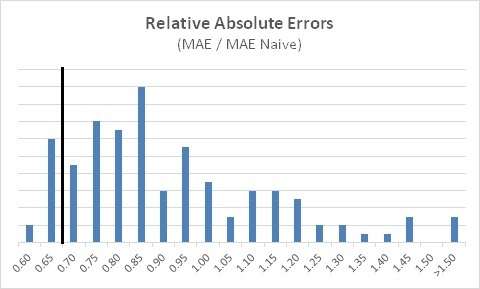 In this example the avoidability ratio was > 1.0 (using either MAE or MSE), indicating a very poor forecast that was actually worse than a naive forecast, and was also significantly biased (averaging nearly 5% too low). A good (value adding) forecasting process will deliver ratios < 1.0, and (we hope) get down below 0.7 for MAE (or 0.5 for MSE). I've been following Steve Morlidge's work and was so happy to run across your blog walking through the maths. I'm "trying this at home" and strugling with the Squared Naive Error and Squared Error columns in your example. Is there an error in your squaring formula? Given the first week's absolute naive error of 43, I was expecting the Squared naive error to be 1849. Likewise for the absolute error and squared values. I expected 23 & 529. Is this a mistake in the example table or am I missing something? Hi Lawrence, thanks for the note, and glad to hear you are trying this at home!